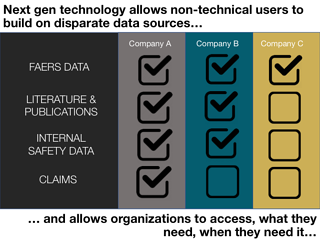 One of the key benefits of a drug safety evidence aggregation platform is the data source flexibility it provides. Historically, smaller organizations have put off automating aggregate signal detection on FDA Adverse Event Reporting System (FAERS) data to avoid the cost and time commitment needed to implement traditional signal detection software. And those organizations that do have traditional software installed, have typically limited use to specific functional areas within drug safety and “expert” users, making FAERS data and analytics hard to access. An evidence aggregation platform makes these data and the related analytics easy and provides for a robust source of insight. Smaller organizations no longer need to put off automating aggregate signal detection. The resources needed to get up and running are minimal, and the platform allows for easy scalability when the team is ready to increase its efforts. Take for example the case of a biotech company with 2 drugs on market with a pipeline of expanding, labeled indications. Their safety database is hosted by a third party and their periodic and annual aggregate signal detection reporting is done directly from the database manually. This solution, while cost effective, is not scalable and leaves their safety reviewers without the proper assessment tools. They were hesitant to even look into legacy providers, as they knew the time and budget commitment would be too much for their small team. However, after learning about drug safety data aggregation platforms, like Evidex, they realized there was another way. A drug safety evidence aggregation platform can provide an easy-to-use interface to access both qualitative data such as labeling information, seriousness, and disease related classifications, as well as sophisticated data mining analytics such as reporting odds ratios (ROR), proportional reporting ratios (PRR), and other safety specific statistical calculations. The flexibility of the platform allows for on-demand add-ons of other datasets such as curated clinical study outcomes data, their own internal data from safety systems, or other real world data like claims and social listening, thus scaling with the organization as it grows. In larger organizations with established workflows and software, there is also a strong argument for better, simpler tools like Evidex for access not only to FAERS data, but for the types of data integrations the platform can provide. In many cases a platform like Evidex would allieviate the need for a drug safety physician to have to request an analysis of FAERS data to use as a benchmark. Rather, she would be able to access the data herself on-demand. And with Advera Clinical Evidence module, she could compare her organization's data to a pooled meta-analysis of clinical trial results of similar compounds. If the signal requires further evaluation, claims data can be used, all without the need of data scientists. These case studies outline how a safety data aggregation platform makes FAERS data and related analytics easy and actionable. 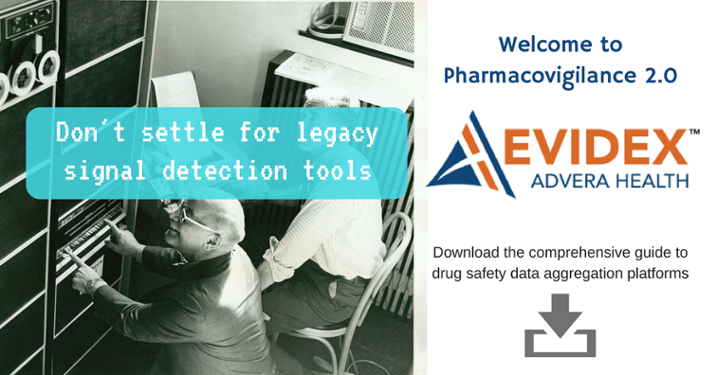 To see more case studies, download the white paper, Drug Safety Data to Support the Entire Life-Cycle: An Introduction to Drug Safety Data Aggregation Platforms.